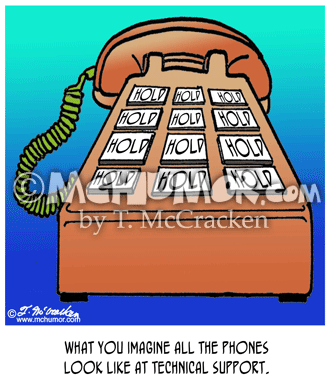 Tech Support Cartoon 8298: "What you imagine all the phones look like at technical support." A phone with nothing but hold buttons. 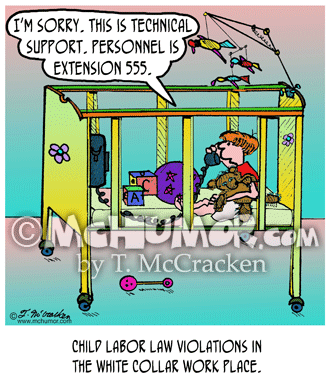 Baby Cartoon 8296: "Child labor law violations in the white collar work place." A baby in a crib and on the phone says, "I'm sorry. 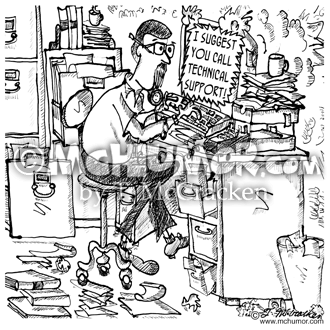 This is technical support. 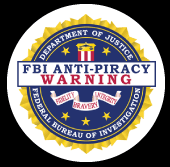 Personnel is extension 555." 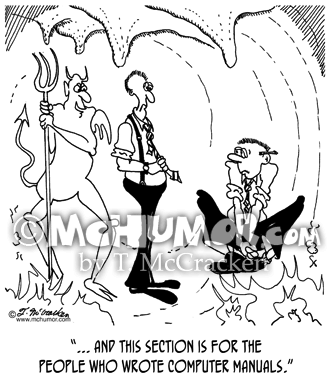 Computer Cartoon 5366: Devil to new arrival in Hell, "... and this section is for the people who wrote computer manuals." 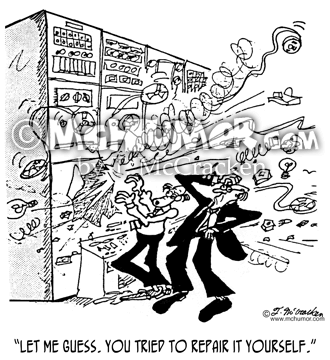 Computer Cartoon 4637: As a computer explodes someone says, "Let me guess. 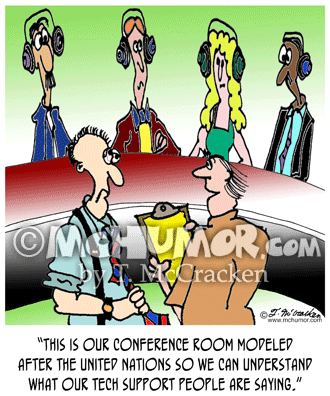 You tried to repair it yourself." 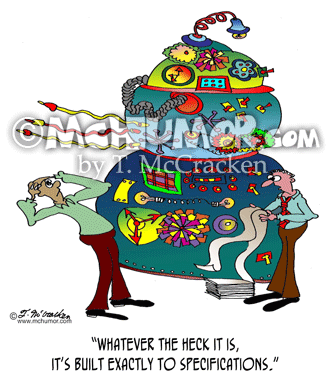 Engineering Cartoon 7524: Standing in front of a humongous Rube Goldberg like machine an engineer reading from a huge stack of paper says to another: "Whatever the heck it is, it's built exactly to specifications." 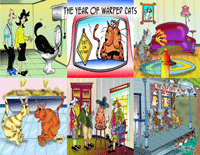 Audio Cartoon 7747: A video tech on a desert island sees case of cables wash up on shore. He says, "Oh great. 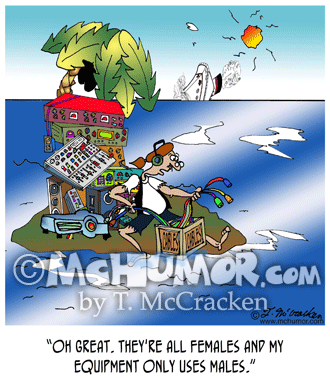 They're all females and my equipment only uses males." 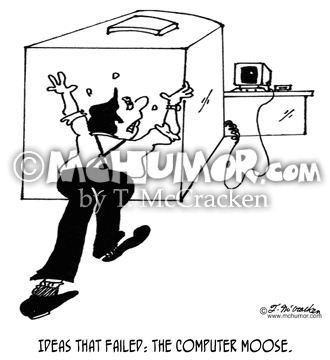 Computer Cartoon 5874: "Ideas that failed: The computer moose." A man pushes a ten-foot computer mouse. 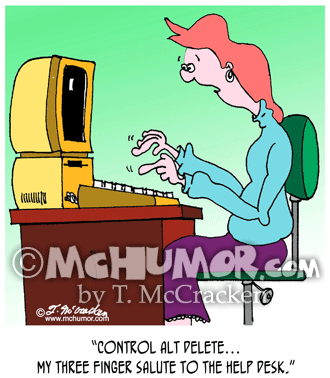 Computer Cartoon 8986: A frustrated woman at a computer says, "Control Alt Delete…My three finger salute to the help desk."